Are you ready to break away from the traditional Japanese steakhouse image and style? KiTARO – Bistro of Japan has opened new doors in O’Fallon, Missouri (St. Charles, MO County) with a unique dining experience and contemporary atmosphere. Enjoy upscale, but affordable specialty entrées including Japanese steak, seafood, sushi and limitless creation dishes. If you enjoy great food and entertainment, try our Hibachi Dinner or Lunch; prepared and served right in front of you by KiTARO’s Chef. 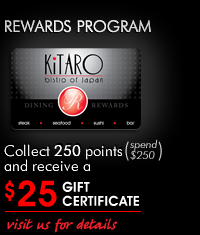 KiTARO is proud to offer the most exquisite full Liquor Bar and Japanese Sushi Bar in the O'Fallon area, making it an excellent choice for business lunches, evening dining and late-night socializing / entertainment. And let’s not forget KiTARO’s great ‘Happy Hour’ specials! If you’re west of St. Louis, prepare for creative cuisines from the near, and far east. Visit us & Enjoy! Our executive chef inspires an excellent menu through many delectable cuisines with a comprehensive range that fuses unique Asian culture and traditional American influences to create a flavorful masterpiece.